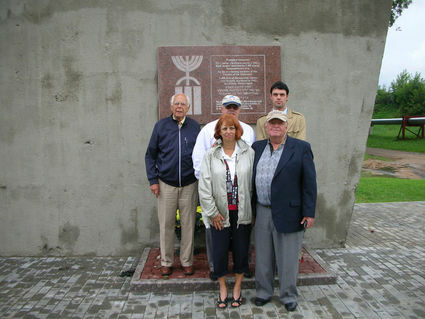 The families that helped form the Belarus Holocaust Memorials Project. Shown here (back row, l-r): Morty Geisler, Warren Geisler, Joshua Geisler (nephew); (front row, l-r): Marilyhn Kletter, Miles Kletter. How does one keep the memory alive of the 800,000 Belarusian Jews killed during the Holocaust? For two Jewish families with links to Florida, along with a couple from England, the answer was simple: One monument at a time. In the first half of the twentieth century, the Jews in Belarus were its third largest ethnic group in this Eastern European country. The population of cities such as Minsk, Pinsk, Mahiliou, Babrujsk, Vitsyebsk, and Gomel was more than 50 percent Jewish. Tragically, some 800,000 Jews-80 percent of the Jewish population-together with transports of Jews brought for extermination from the remaining communities in Western Europe, were killed in Belarus during the Holocaust. Many were killed by mass shootings, or “Holocaust By Bullets,” in which executioners massacred the victims in their own villages before the eyes of the neighbors. In 2006 Dr. Michael Lozman, a Capital District orthodontist, introduced Dr. Warren Geisler, a Capital Region dentist, to the Holocaust By Bullets in Belarus. As a one-time partnership they, together with personal donations with the help of community donations as well, built a memorial to the 433 victims of the Holocaust in Grozovo, Republic of Belarus. The late Dr. Miles Kletter, a Capital District dentist and philanthropist as well as a dear friend of Geisler, generously donated the site. Kletter researched and located Michael and Diana Lazarus in London, England, who had been building these memorials since 2003 through their Simon Mark Lazarus Foundation. After multiple discussions, Miles and Marilyn Kletter and Warren and Beverly Geisler and their respective families each formed foundations in 2008. Their donations, together with the Lazarus family, would be placed into what was called the Belarus Holocaust Memorials Project through the American Jewish Committee in New York City. These three foundations, together with Jewish communities and organizations across Belarus, established the Committee for the Preservation of Holocaust Victims’ Memory in the Republic of Belarus. The Committee, comprising dedicated and steadfast members of the community’s representative bodies, provides crucial support in identifying the locations and coordinating the construction of Holocaust memorials. In 2012, Cary and Joni Kletter, the son and daughter of Marilyn and Miles Kletter, took over their father’s work when Miles died of cancer. They are involved with BHMP on many levels: facilitating the foundation’s financial involvement, designing and managing the BHMP website; traveling to Belarus for ceremonies; coordinating with officials in Belarus; and working on the content and layout of the website. Beverly and Warren Geisler and Marilyn Kletter now split their time between homes in Upstate New York and Florida, in West Palm and in Boyton Beach respectively. Through research and the help of those individuals who lived in the area during the war, over 500 mass killing sites have been identified. The number of Jews that died at each site ranges from two to thousands. Each year, the Belarus Holocaust Memorial Foundation selects up to six sites to place a memorial. As of May 2018, 110 Holocaust memorials designed by Belarussian architect Leonid Levin have been erected at Holocaust massacre sites in cities, towns and villages throughout the country. The goal of the BHMP: To have memorials at every site. At each killing site there is a black granite tombstone, set on a flagstone platform mounted on a pedestal. Each contains inscriptions in three languages-Belarusian, English and Hebrew-stating that this monument was erected in memory of the victims of Nazism. Where known, names of the victims are noted. 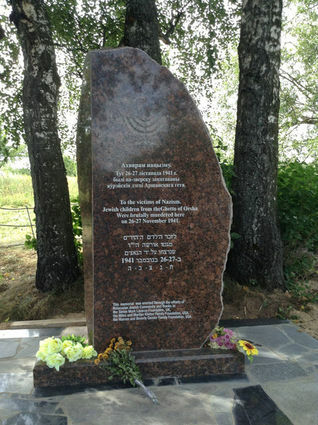 On July 26, 2009, a plaque was placed on a bridge abutment by a river where 3,400 Jews from the Baranovichy Ghetto were pulled off the cattle cars, shot, and dropped in the river in the Zeliony Most region. Another memorial has been placed in a rolling field near the Bagerovo village where approximately 4,670 Jews were forced to strip to their underwear, lined up, shot and buried in an anti-tank trench. Dedication ceremonies drawing hundred of people are held at each killing site upon completion of the memorials. Many are from Belarus: representatives of the local authorities, members of the Jewish community, and representatives of Jewish organizations functioning in the region. The Israeli ambassador to Belarus as well as ambassadorial staff members from Germany, United States, Great Britain, Israel, and the United States have also attended. Kletter said that at a dedication in 2017, the ambassador from Germany to Belarus publicly apologized to him and all the attendees for the atrocities that were committed. Geisler said one his most unforgettable moments was when the last living survivor of the Minsk ghetto came to a dedication. After introducing himself, he thanked Geisler and BHMP for what they are doing to make sure that the Holocaust would not be forgotten. More than 500 mass killing sites in Belarus have memorials like this one in the Ghetto of Orsha. The rise of anti-Semitism in Europe has been disconcerting, noted Dr. Geisler. In 2014, the Belarus Government requested that a memorial be placed at a site where 2,500 children from the Orsha Ghetto were killed in November 1941 soon after their brutal separation from their parents. The dedication was attended by numerous Belarus government officials and was broadcast on national television. Within a short time, the site was burnt and vandalized. Although it was rebuilt, the specter of hatred remains. Further information regarding the Belarus Holocaust Memorials Project can be found at its website https://www.belarusmemorials.com. Marilyn Shapiro lives in Kissimmee. She writes regularly for the Jewish World in Schenectady, and published her book “There Goes My Heart,” which is available on Amazon. You may also follow her on her blog, theregoesmyheart.me.